Votes from the Nov. 7 election are still being counted in Santa Clara County, as up to 11 races remain too close to call, election officials said Tuesday. 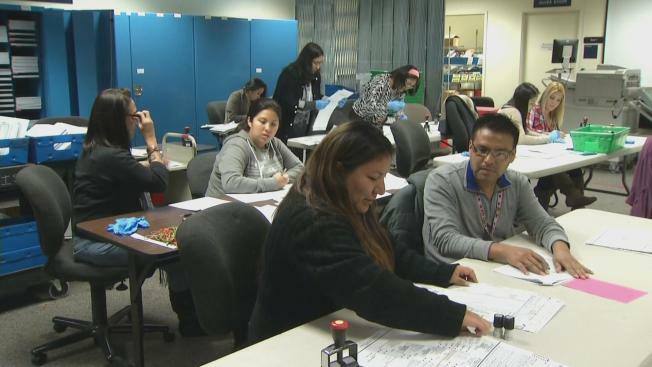 As potential winners and losers wait, election workers are putting in extended hours to count the ballots cast by about 900,000 voters across the county. And the recount process has yet to be applied. Karin Accorinti has worked on Santa Clara County elections for 15-years. She said this election season has been challenging for all the workers. "We have been working seven days a week, 12 to 14 hours a day," she said. "We have had busy elections before, but this is the election with the longest ballot, so we have been working long hours. We're almost finished." But it won't be over even when all the votes are counted. Officials expect to reach 100 percent of the ballots counted by early Wednesday, and it appears there are seven races close enough for a county-required recount, with another four on the fringe. "The first time all of our ballots were counted by hand when we're doing a recount; it's a hand recount," county Registrar Of Voters Philip Chantri said. "So it's literally teams of four that are sitting there, and they are hand-counting ballots." Some of the closest races include the one for Santa Clara police chief. Incumbent Michael Sellers leads challenger Sgt. Pat Nikolai by only 106 votes. And in San Jose's District 8 council race, Sylvia Arenas appears to be the winner over Jimmy Nguyen by 88 votes, with only a handful of write-in votes remaining. "I'm not celebrating just yet," Arenas said. "I'm going to wait for that recount. But, like I said, I'm cautiously optimistic. Still better to be ahead than behind." Election officials had a contingency plan in place for recounts and still hope to certify all the results by Dec. 8.